Ultramax DF gives you the versatility of both ultrasonic and mechanical applications. 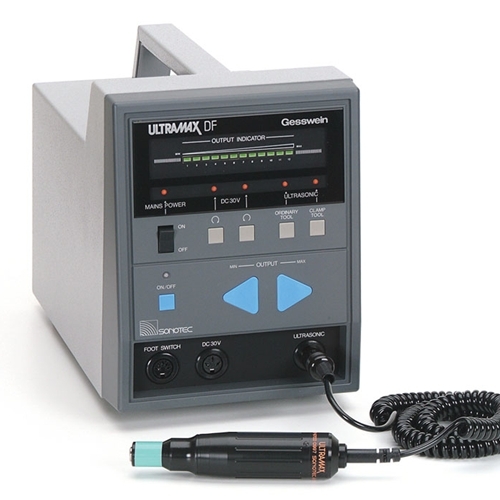 UltraMax DF accommodates the UF-9700 ultrasonic handpiece (included) and Gesswein's entire line of electrically powered Power Hand 2X mechanical handpieces. When used with the Ultramax DF, the mechanical handpieces have 30% more torque. Other mechanical features include forward/reverse touch pads and complete motor stop for full motor armature protection. Tool Box with a 30-piece tool set that includes 4 diamond files, 3 diamond stones, 2 resin-bonded diamond stones, 6 ceramic stones, 2 lapping tools, 1 clamp tool holder for round tools, 4 clamp tool holders for flat tools, 1 protector sleeve and 1 large beveled handpiece protector sleeve, 8mm wrench, two 10mm wrenches, a 13mm wrench, 1 Allen wrench, a set of earplugs and an extra fuse. Variable Control Foot Rheostat adjusts ultrasonic power or rpm level by foot pressure. On/Off Foot Switch provides constant ultrasonic power or speed. Both foot controls fit either the Ultramax SF or DF. Prolonged use of vibrating or reciprocating tools may result in vibration-induced circulation problems in the hands. Always follow safe operating procedures. Using hand protection (i.e. insulated gloves) and taking frequent breaks can help minimize but not guarantee against injury. Operating these types of tools in cold weather or with a tight grip will reduce the period of operation before risking potential injury. Individuals with a tendency to suffer from poor circulation, frequently cold fingers or itchy hands should closely monitor the condition of their hands. If symptoms appear, seek medical advice immediately. Dimensions: 5"L x 9/16" diameter tapering to 13/32"